Valentine’s day is right around the corner. We have some great gift ideas for you for that Special Someone in your life! Come in and purchase a $75 Candessa Gift Certificate or $75 treatment and you will receive our AMAZING Soberry Gift Set Complimentary. This gift set includes a lotion and bath/body oil. Both of these products contain true oils, unlike lotions and products that you will find at the shelves at your grocery store or mall retail store.The Soberry lotion smells amazing and contains strawberry, chamomile and arnica extracts. The chamomile and arnica helps soothe the body and soul. This light non-greasy moisurizing lotion leaves skin feeling smooth, supple and silky soft. 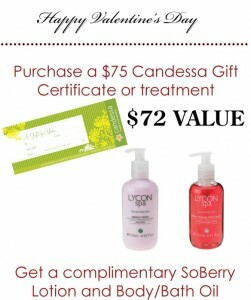 The Soberry massage and bath oil can be used all over the body and helps moisturize the skin as well. It can also be poured into water to make a wonderful bubble bath. This gift set retails at $72.00. The duo is gift wrapped and 100% ready for you to deliver to your Valentine. We have a limited quantity, so call our office today to get yours. The gift certificate can be used for any of our facials, peels, laser services, tinting/waxing and product. If you aren’t exactly sure which one that special someone in your life would like, you can always get a gift certificate for a dollar amount and one of our master estheticians will meet with them to discuss what the best option is for them.